Available for: iPhone/iPod Touch and iPad, iOS 6.0 and above. 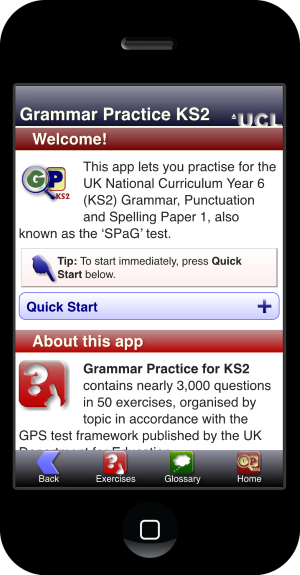 Grammar Practice KS2 (GP KS2 for short) is an app for helping school children in Year 6 (Key Stage 2) of the UK National Curriculum pass their Grammar, Punctuation and Spelling (GPS) Test Paper 1 (Short Answer Questions). This is the test at the end of primary school that is meant to evaluate a pupil's knowledge of English grammar. This app is not a substitute for paying attention in class! It is a practical app to help a child practice what they have learned, test their own knowledge, and focus on the areas they find difficult. GP KS2 offers 50 practice exercises using real English age-appropriate example questions selected by linguists. Each exercise focuses on a different type of question that children are likely to see in their test. All the child has to do is practise each exercise a few times until they start getting 100%. 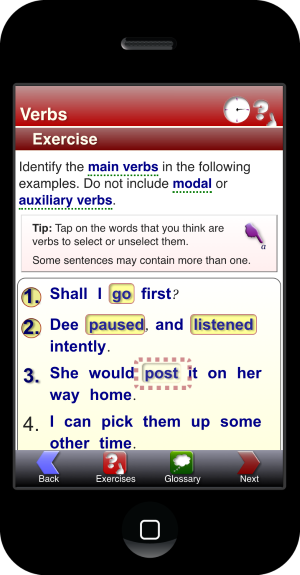 If they are still confused, the app contains the complete Englicious Glossary, condensed into an easy-to-use app format. 50 interactive exercises containing nearly 3,000 test questions that help you revise what you have learned for the GPaS Test. 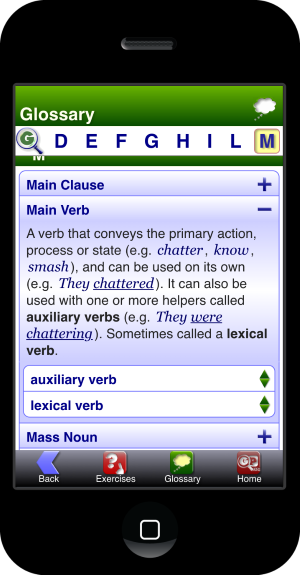 An extensive glossary of grammatical terms, drawn from the Englicious website containing the non-statutory National Curriculum glossary plus our own explanations. 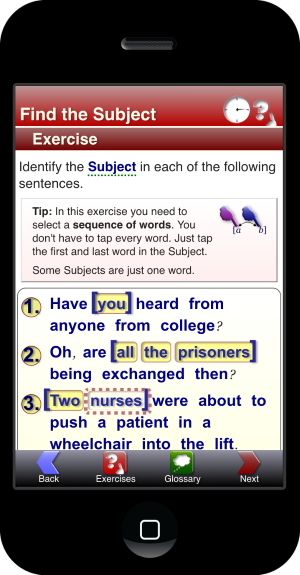 Like our other apps, GP KS2 uses examples of English sentences from our natural language corpus, ICE-GB. ICE-GB is a linguistic database compiled and analysed at UCL and used by researchers around the world. The aim of this app is to address the challenge of the test. So occasionally we created example sentences to make them closer to the questions that would be asked. And of course all sentences are age-appropriate. 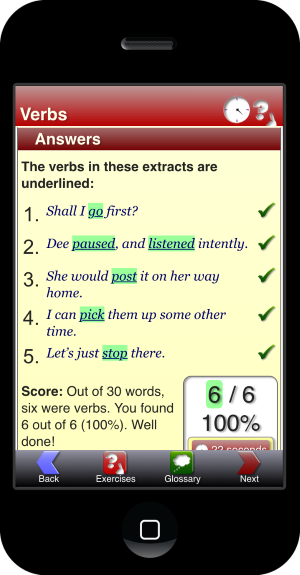 The 50 exercises cover every grammar question a child is likely to be tested on, from identifying nouns and verbs in a sentence to spotting when a sentence contains a subordinate clause or deciding whether a sentence uses a subjunctive verb form or whether it should be understood as formal or informal British English. The exercises were developed from the New UK National Curriculum test specifications, past papers and the recent sample paper. They draw from nearly 3,000 example questions, so if you have managed to master these, you should be confident about the official test! If you are getting your answers right all the time, you can do the same exercises against the clock. Grammar Practice KS2 is written by a team of linguists at University College London (UCL), independently ranked as one of the world's best universities. The same linguists also developed the Englicious website for school teachers. WHO IS GP KS2 FOR? The app is designed to be used by Year 6 school children without parental assistance. But many parents will want to see what all the fuss is about - and many children will want to see if their parents can answer the same questions they have to! Aarts, B., Wallis, S.A., Mehl, S. and Smith, E. 2016. Grammar Practice KS2. London: Survey of English Usage / UCL Business PLC.